This Class A office building uses four 500 ton Baltimore Air Coil cooling tower cells for a total of 2000 tons of cooling. The building’s previous cooling tower water treatment program maintained 3 cycles of concentration, or 33% water waste. The Terlyn Conservation Program slowly removes existing scale while online. When first installed, the Terlyn Program cleaned a massive amount of existing scale from the system that settled loosely in the sump of the cooling towers and was easily removed during the physical tower cleaning. Over these eight years of operation, corrosion coupon results have been in the excellent range for both copper and mild steel, and no biological growth has ever occurred in the system. In eight years since the Terlyn System was installed, the cooling towers at the Franklin Templeton Building have conserved 14,087,208 gallons of water. This dramatic reduction in water consumption reduced their water bills by a total of $46,800. Due to consistent low occupancy of the building, two 500 ton towers and one 750 ton chiller were alternated for even wear of the equipment. Subsequently, the generated savings are more consistent with a 500 ton system. 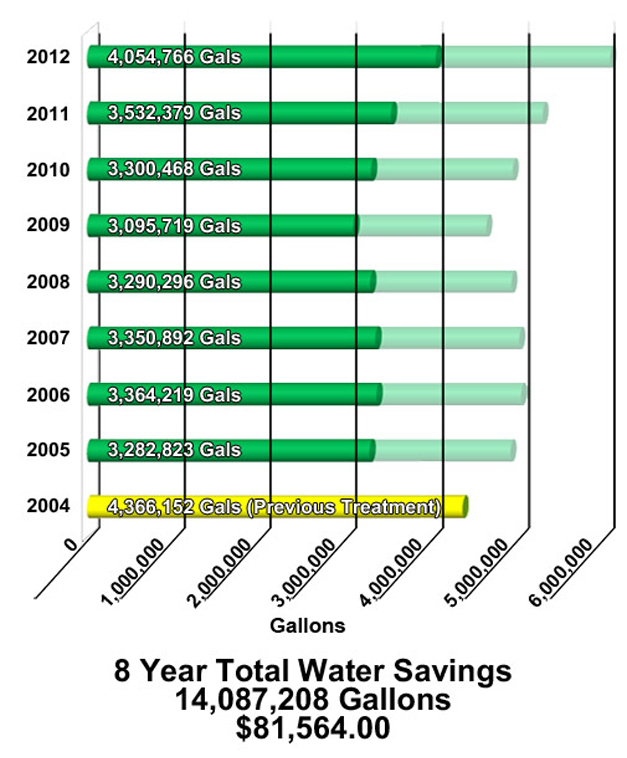 The savings graph below represents the total cooling tower water usage previous to installing the Terlyn Program in 2004. Each consecutive year on the Terlyn Conservation Program shows the actual water usage, as well as what the water usage would have been had the system remained at three cycles of concentration (represented by the lightly shaded portion on the right side of the bars).